Navarra export catalogue - Liebherr Industrias Metálicas, S.A.
Liebherr Industrias Metalicas S.A, forms part of the liebher group since 1990. 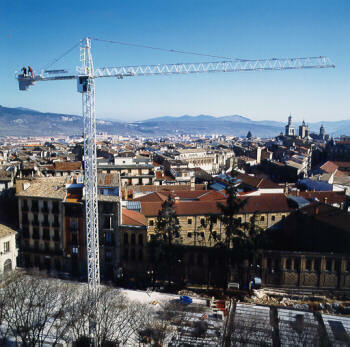 It is dedicated to the production and sales of a large range of tower cranes, both bottom-slewing and top-slewing .Furthermore, the company markets the whole ranges of Liebherr towers cranes. Having moved to the newly built production site in 1997, Liebherr now has considerable scope for nature development. The new factory, built on a 175.000m2 site, enables Liebherr to manufacture cranes using the latest technologies.All necessary equipment and supply is available, for example cnc-regulated machines as well as automatic welding installations, modern and enviromentally acceptable paint-shops an ample space for final assembly. 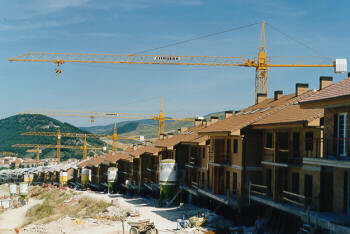 This makes the liebherr plant in Pamplona one of the most modern crane factories worldwide.